SRAM was not content to design its new wireless electric shifters as retreads of its old design — and that's a really good thing. SCHWEINFURT, Germany (VN) — Though the cycling world uses the term “shift logic” to refer to any user interaction for changing gears — a lever throw here to go up, a button press there to gown down — SRAM’s new Red eTap wireless drivetrain is the first group that actually lives up to the term. It is, simply put, more logical than anything else out there. To illustrate this point, let’s perform a quick exercise: I’ll explain, as succinctly as possible, how to shift a Shimano Di2 electronic drivetrain. (You already know how, but stay with me.) Then I’ll do the same with eTap. Let’s compare how many words each explanation requires. Shimano: On the right side, press the bottom paddle for a harder gear and the upper button for an easier gear. On the left side, push the upper button for a harder gear, and the lower paddle for an easier gear. SRAM eTap: Press the right button for a harder gear, the left button for an easier gear, and both for a front shift. Fourty-eight percent fewer words for SRAM. Does this mean that eTap is 48-percent less confusing? No. To a new rider, it’s probably even better. Anyone who has tried to teach a new cyclist how Shimano Di2 or Campagnolo EPS — or any mechanical system — shifts knows that none of the currently available groups are in any way intuitive. We could perform a similar test for overall drivetrain setup, except SRAM’s margin of victory would be even greater. At SRAM headquarters last week, one of the company’s mechanics mounted, synced, and adjusted the new drivetrain for a waiting press corps in just over five minutes. When drivetrains were mechanical, the lack of intuitive controls was understandable. 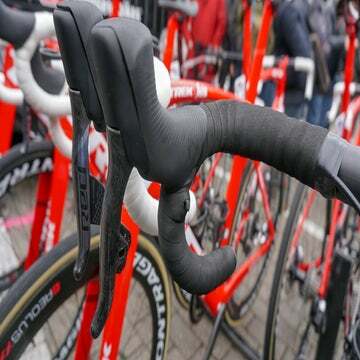 Engineers were hamstrung by the need to physically pull on derailleurs to make them move; shifters were spring-loaded ratchet mechanisms that took in and released actual cable, so all the shifting for one derailleur had to happen in the same place, under the same rubber hood. All three major brands did the best they could given the physical limitations. This is a valid, if somewhat weak, argument. I don’t get confused when swapping between my road and mountain bikes, though the shift systems are completely different. There were employees within Shimano who argued for updated shift logic while Di2 was being designed (I’ve spoken with a few), but the company took the conservative option. 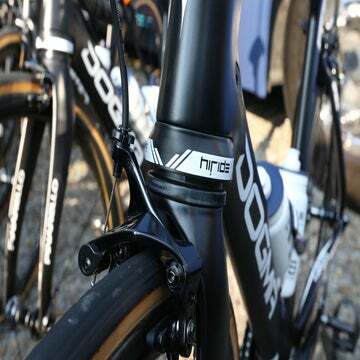 It is possible to change the function of Di2’s shift buttons using Shimano’s E-Tube software. Some brands, like Felt, are even shipping single-ring cyclocross bikes with a left/easy, right/hard shift logic already in place. But few ever make this change, and when running a traditional double chainring setup, it only makes things worse — the shift buttons for the front and rear derailleurs are right next to each other. Di2 and EPS were created within the context of long-honed habit. More accurately, they were designed within a context — mechanical shifting — that was no longer relevant. SRAM’s wireless eTap system feels, for the first time, like a wholesale rethink of the way we shift a bicycle. Di2 and EPS feel like modification, eTap feels like invention. There is no doubt that Di2 changed the way we think about drivetrains, and upped our expectations of a good drivetrain. But Shimano never changed the way we use them, or talk about them. It was more precise, more powerful, but the buttons were the same. All the bits were still connected by wires, and if they disconnected, everything stopped working. The same goes for EPS. For most of us, the shift logic discussion is academic. We know how to press the right buttons on Shimano and Campagnolo shifters. But I found the transition to eTap much smoother than before — it took two or three long rides before I was comfortable with DoubleTap many years ago, while my fingers were poking away at the proper buttons, at the proper time, within half an hour on eTap. Just because we’re comfortable with a needlessly complicated system that doesn’t mean SRAM shouldn’t applauded for recognizing that needless complication, driving a stake through its heart, and inventing something more intuitive. Simple is good. Because drivetrain choice seems to be as close as cycling gets to religion, let me clear something up: I’m brand-agnostic in this realm. I ride all three brands frequently. I like Campagnolo for its firm click, its beautiful lines, and its unapologetic Italianness (some year, I’ll memorize what all of EPS’ blinking color lights mean). I like Shimano’s attention to detail and unbeatable shift quality, in fact I called Dura-Ace mechanical “the best mechanical drivetrain ever,” and stand firmly behind that statement. I like SRAM because the company has always been bold, going first, if not always best, into unknown frontiers like hydraulic road discs and now wireless shifting. SRAM has done it again here. Red eTap is not perfect, but it is unquestionably bold. It will change the way bikes work and look in five years time. Frame brands are already lining up to create eTap-specific models, without the drill holes we’ve come to associate with internally wired or cabled systems. Bikes will be cleaner and simpler. Time trial bikes and their carefully hidden but utterly despicable internal routing will be slightly less hateful. The other players in the drivetrain game will have to catch up. Join the wireless revolution, I say to Shimano and Campagnolo. And change what your buttons do while you’re at it.